The smoke alarm that thinks, speaks and alerts your phone. The alarm goes off and your mind starts to race. It’s time to expect more from your smoke alarm. Nest Protect has been redesigned from the inside out. It has a Split‑Spectrum Sensor, tests itself automatically and lasts for up to a decade. It's also the first home alarm that you can silence from your phone without any extra hardware required. And it tells you what's wrong and can even alert your phone. Meet the Nest Protect. The smoke alarm that other alarms look up to. Nest Protect has a friendly human voice that gives you an early warning. That way you can handle burning toast before it becomes a burning toaster. Tells you where the danger is. And when one speaks, they all speak. So the alarm in your bedroom can tell you there’s smoke downstairs. No chirps: Tired of being woken up at 2 a.m. by your smoke alarm? Long before it has to chirp, Nest Protect tells you that its batteries are running low with a message on your phone. Family Accounts: Everyone in the family can have their own Nest account. No more sharing a password. You can all use your phones to silence and test alarms. And you'll all receive alerts on your phones if something's wrong at home. In the 1970s, it would take about 30 minutes for a fire to take over a room. Today, it can take less than 5. Sees both fast and slow-burning fires. The Split‑Spectrum Sensor detects fast-burning fires quicker than any other photoelectric sensor. Carbon monoxide is poisonous, but you can’t see it or smell it. That’s why Nest Protect has a long-lasting carbon monoxide sensor that keeps working for up to a decade. Lights your way: If you need a glass of milk in the middle of the night, Nest Protect lights up as you walk underneath it. Pathlight is one of our customers' favourite features, so we've made it better and brighter. Steam is not smoke: Has your alarm ever yelled at you for having a shower? Nest Protect comes with Steam Check. It uses custom algorithms and a humidity sensor to look for steam so that you can enjoy a nice, quiet shower. No one should be woken up by a low-battery chirp at two in the morning. When you turn off the lights, look for a quick green glow. That's our Nightly Promise. 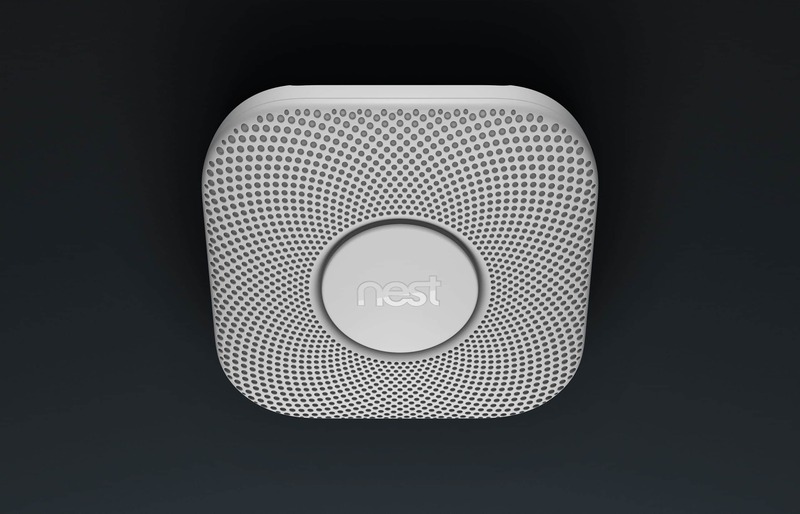 It means that all your Nest Protects have tested themselves, the batteries are fine and there won't be any chirps. Sweet dreams. Nest products are made to work together. And they can even work with lights, locks and other products in your home. Mobile alerts require working Internet and Wi-Fi. Video streaming, video recording and mobile notifications require working internet and Wi-Fi.